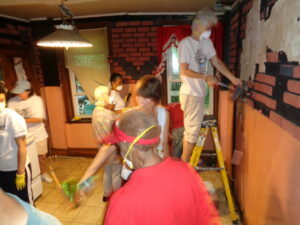 URDC is pleased to support 10 volunteer days this summer with its member congregations and Glenside Church of Christ. The public is invited to participate in any of these volunteer days – it is a great way to assist your neighbors in need. URDC’s 2018 summer volunteer day schedule is shown below. If you wish to participate in any of these volunteer days, feel free to contact URDC here on our website, by phone (267-289-2159) or by email at info.urdc@gmail.com. Most days start at 8 A.M. and end by 3 P.M.; no special skills are required. Make a difference in our community. Sign up for one of URDC’s volunteer days today!